When people talk about file compression, they usually mean ZIP. In fact, they often make it into a verb--much like we “Google” things on the Internet, we “zip” files before sending them over email. But ZIP is just one compression format, and it isn’t necessarily the best. Free, open-source utility 7-Zip supports ZIP, but also the much-improved 7z compression format. It's available in a 32-bit version and a 64-bit version. With an optional dual-pane interface, 7-Zip can double as a file manager in a pinch. In fact, 7-Zip is the official reference implementation for the 7z format, and since it is open source, the format specification is distributed right within the source code. To test it, I used a folder with 65MB of easily-compressed documents such as DOC, XLS, and BMP files; it also contained a few small ZIP files for good measure. Zipped using Windows Explorer, the folder compressed to 8,881KB. 7-Zip compressed the same exact folder down to 6,036KB, shaving almost 3MB off the archive. That’s a difference of more than 25%--phenomenal, really, when you consider ZIP’s market dominance. Speaking of market dominance, that’s another key difference between the 7z and ZIP formats. 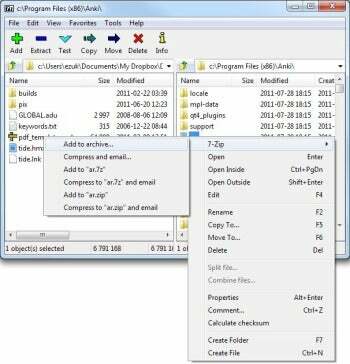 Windows Explorer has been handling ZIP files like folders for years, and most people recognize them instantly and work with them all the time. But send someone a .7Z file, and they may not know what to do with it--in fact, they may not even realize it’s a compressed file. Note that I call it a “difference” rather than a disadvantage: These days, many email providers (including Gmail) snoop into any ZIP file you send, and if it contains executable files, simply don’t let you send it. Compress your executables using 7-Zip, and you can email them to anyone you like. 7-Zip doesn’t always offer a superior compression ratio: When I tested it with a folder full of JPG files (which are already well-compressed), the resulting 7z archive was actually 78KB larger than a ZIP of the same folder produced by Windows Explorer. However, the archive was nearly 34MB in size, so a 78KB difference is negligible. When you first launch 7-Zip, its interface is simple and sparse: Just a list of files, along with six large toolbar buttons and a menu. No Wizards, welcome dialogs or any other pesky interruptions between you and your files. If you’d like to give the interface a bit more “oomph,” hit F9 and 7-Zip will be transformed into a basic dual-pane file manager. You can even save up to ten folders as “Favorites” if you use it often for traversing your file system. All in all, 7-Zip’s user interface will probably not blow you away. Its impressive compression ratios, however, just might.